Wundwin Township is located in the Dry Zone of Myanmar in the Mandalay Region. Due to the topography and climate of the region, frequent droughts and water shortages are experienced in many areas. Report conducted by UNDP and WFP found that insufficient/delayed rainfalls affected crops of 67% of the farmers in Dry Zone areas and the entire sample also reported no access to irrigation systems. Village communities in rural Myanmar obtain water for drinking and day-to-day consumption from open wells, unprotected springs and creeks, rivers or ponds – often located some distance away from the village. The task of fetching water usually falls to the women and children. During the dry season, the probabilities of these water sources drying up increase, forcing them to walk even further for alternative water sources, which are almost always contaminated. When water is scarce, people are forced to drink dirty / contaminated water. 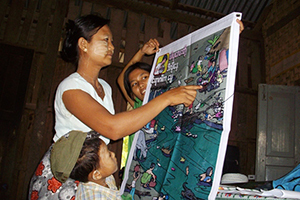 The objectives of the programme are fourfold: a) To enhance capacities of the communities for project implementation through the ‘People’s Process’; b) To provide basic infrastructure to access water and facilitate water distribution and storage schemes; c) To educate communities on safe hygiene practices and d) To develop skills of community in disaster resilience construction methods leading to sustainable skill transfer and in-house knowledge of safe retrofitting / maintenance practices in order that will provide these services in future to their own villages and outside. 9,971 households representing 69,101 individuals were directly benefitted from the water supply and sanitation support activities. 40 village development committees were formed through election process. 80 local carpenters/masons/artisans trained on safer construction practices and provided with toolkits to facilitate future livelihoods and trade. 5 school sanitary toilets, 960 fly proof latrines, 960 concrete tanks for hand washing facilities, 1,000 ceramic jars, 36 hand dug wells, 36 shallow tube wells with engines, 7 ponds, 5 bridges were upgrades, 1 piping system to village, 2 over head ground tanks were renovated / upgraded / constructed.